Ven. Dr. Jabo Prajna is a Zen Buddhist Priest and Bodhisattva Monk in the Five Mountain Zen Order. She began studying Theravâdin Buddhism in 1998, adding Zen with the Kwan Um School and later with the Golden Wind Zen Group in 2003, and Tibetan Buddhism in 2008. She currently practices in both the Zen and Tibetan traditions. She began to study Zen with Ven. 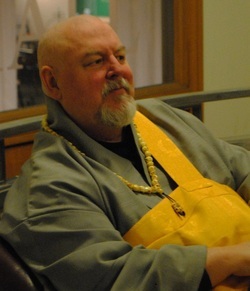 Wonji Dharma in 2003 when he was abbot of Ocean Eyes Zen Center. Additionally, Ven. Jabo has taken Refuge Vows and Bodhisattva Vows with Tibetan guru Lama Tsultrim Allione of Tara Mandala in Colorado. She attends extended retreat with Lama Tsultim yearly, studying the inner depths of Vajrayana Buddhism. Ven. Jabo received Inga from Ven. Wonji Dharma on April 16, 2016. She is currently studying to become a teacher in Lama Tsultrim's lineage, as well. Ven. Jabo is also a Reiki Master who practices at Reiki from the Heart in Claremont, California. She earned a J.D. from Western State College of Law at Argosy University in Fullerton, CA graduating in 2002. She is now retired from teaching and administering as a Law Professor and is a full-time priest. Ven. Jabo facilitates twice-weekly practice in Claremont, CA as well as offering periodic workshops and retreats at both Single Flower Zen Center and Ocean Eyes Zen Center. In her free time, she paints, makes jewelry, drums, and spends her days with her husband Michael and her animal friends. You can visit Ven. Jabo's blog here. You can make donations directly to her here. Ven. Dr. Wonji Dharma, is a Buddhist Monk, a Zen Master and the Founder and Guiding Teacher of the Five Mountain Zen Order. Ven. Wonji began practicing Advaita Vedānta as well as Vipassana Meditation in 1986 with Swami Chaitanya Siraj and took refuge vows with his teacher that same year. Swami Chaitanya Siraj had studied in an Indian Ashram for many years and his path of teaching was wide and open to all of the Wisdom Traditions. Ven. Wonji's direction has been informed by Zen since his College days of studying Psychology. Wanting to experience the direct experience of koan study he eventually discovered Zen Master Seung Sahn and the Kwan Um School of Zen in 1989 and began practicing regularly at Dharma Zen Center in Los Angeles. Throwing himself headlong into Zen practice for five years he received sanction and encouragement from Zen Master Seung Sahn to open the Huntington Beach Zen Center on August 14, 1993, where Ven. 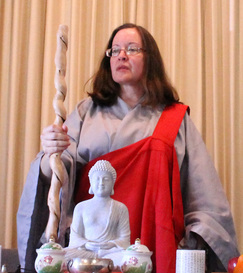 Wonji was installed as Abbot by Zen Master Seung Sahn during the Opening Ceremony. Soensanim was ordained by Zen Master Seung Sahn as a Dharma teacher in 1995 and received teaching authorization from Zen Master Ji Bong, (an independent heir of Zen Master Seung Sahn), in the Golden Wind Zen Order in April, 2006. Wonji Dharma took the 250 Dharmagupta vows of a Bhikku on November 1, 2012 with the Ven. Dr. Suhita Dharma, who is the first Dharma Heir of the Ven. Dr. Thien-An. This means that the Five Mountain Zen Order has a dual Zen Lineage, one from Korean through Zen Master Seung Sahn and the other from Vietnam through the lineage of Ven. Dr. Thich Thien-An. He has practiced with more than thirty different Zen Buddhist masters during his time and maintains an eclectic approach to spirituality. Having founded the Five Mountain Zen Order, he no longer participates with the Golden Wind Order. In June of 2012 Ven. Wonji received a Doctorate in Buddhist Psychology from the Buddhist Studies Institute, and was then elected as the President of the Institute by Ven. Karuna Dharma the previous President of the College. 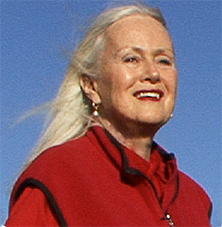 Lama Tsultrim Allione is founder and resident lama of Tara Mandala. She is author of Women of Wisdom and Feeding Your Demons. Born in New England to an academic/publishing family, she traveled to India in her late teens and was ordained as a Buddhist nun at the age of 22 by H.H. the 16th Karmapa. She was the first American to be ordained as a Tibetan Buddhist nun in the Karma Kagyu lineage. After living in the Himalayan region for several years she returned her vows and became the mother of three, while continuing to study and practice Buddhism, particularly focusing on the lineage of Machig Labdron and Dzogchen teachings. In 1993, Lama Tsultrim founded Tara Mandala, a 700-acre center in southwest Colorado where an extraordinary three-story temple in the form of a mandala, dedicated to the sacred feminine in Buddhism has been constructed and consecrated. In 2007 while traveling in Tibet she was recognized as an emanation of Machig Labdron at the historic seat of Machig Zangri Khangmar by the resident lama. This recognition was confirmed by several other lamas and in 2012 she was given the Machig Labdron empowerment by HH the 17th Karmapa. She was awarded the international “Outstanding Woman in Buddhism” in 2009 by a panel of distinguished scholars and practitioners in Bangkok, Thailand.